One thing that is certain to get me riled up is bad customer service. The importance of excellence in customer service was one of the first key learnings of my work life. As a result, I have little tolerance when I am the recipient of bad customer service. 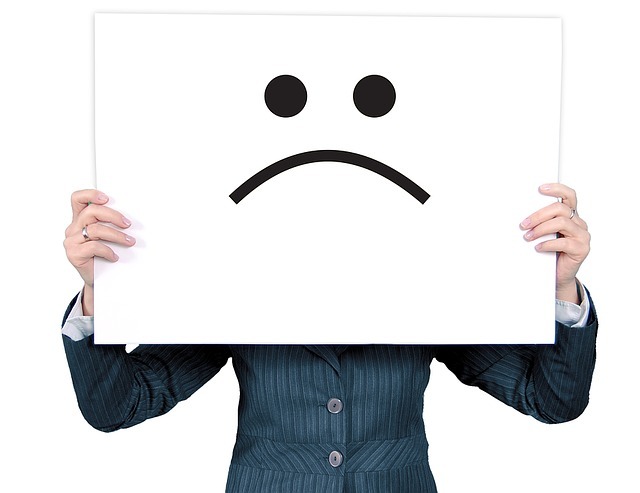 In most cases, bad customer service can be attributed to either poor employee selection or inadequate training of employees. In these instances, a customer's satisfaction can often be achieved by requesting intervention from a supervisor. But what can a customer do when the service issue is systemic or goes unresolved for long periods of time? Recently, I had a very negative customer experience with Macy's, a large U. S. based department store. Last summer my Macy's American Express credit card was used for fraudulent purchases totaling $130.00. This story began with a positive customer experience. I received a fraud alert call from Macy's asking if I had made the purchases. While I was concerned about the fraudulent charges to my account I was pleased to be alerted, expecting Macy's to immediately address the issue. That's where my customer experience went downhill. Macy's and I began a many months-long journey into what I called Macy's credit card fraud hell, characterized by multiple fraud reports, hours on hold waiting to speak with service associates, transfers from one department to the next, letters, and finally, collections calls. 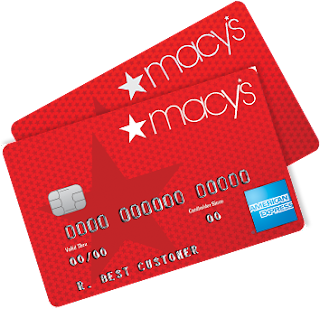 Through this whole experience, Macy's tacked on monthly finance charges to the account increasing the outstanding balance from $130.00 to $456.00. Once the collections calls began in earnest my patience was shot. I was at wits end. All of the traditional methods for resolving customer service issues had been tried unsuccessfully. What was I to do? I decided it was time to turn to social media. 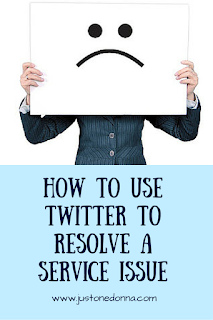 I did a quick search to see if I could find some tips for using social media to resolve customer service issues. There was little help to be found. I was on my own. I decided to use Twitter as my next step. This post is the result of my five days of using Twitter to help resolve my credit card fraud issue. I am hopeful these seven tips will help guide you to a resolution of your service issues as well. Companies (often referred to as brands) most often use Twitter as a marketing tool to promote their brand. They will even pay Twitter users to tweet on their behalf. It makes sense that these same companies don't want negativity related to their brand to permeate Twitter. For this reason, active Twitter users may receive higher priority in responses. Savvy brands know that active Twitter users are more likely to share negative customer experiences and will respond quickly to limit brand damage. According to Fanhub, 25% of Facebook and Twitter users expect their complaints to be replied to within one hour. Search for your target company's official Twitter handle. Most companies only monitor and track @mentions (Source) so it makes sense to always include their official @Twitter handle in each tweet. In my case, there were two brands, Macy's and American Express because it was a fraud issue with my Macy's branded American Express card. Once you identify the company's official Twitter handle, conduct a Twitter search to see what others are tweeting about them. This is a quick way to assess the pulse of customer service in the company. Are there a lot of customer complaints? Are the complaints service related? Can you identify any patterns? Are others tweeting about the same issue you have? Does the company respond? How fast does the company respond? You may even want to send out a tweet or two asking if others are experiencing the same issue as you. Brands must often prioritize their responses. Some brands may receive hundreds, even thousands of @tweets per day. Prepare your tweets using keywords similar to those you have seen receiving responses from the company. Remember you only have 140 characters, so use them wisely. Attach a picture to your tweet to increase your reach. (Source) I used the company's credit card marketing image. As you monitor the company's Twitter feed, engage with others who are having the same customer service issue. Retweet their complaint tweets. Remember the best time to do this is mid-afternoon Monday through Thursday. Don't stop there. Turn to your Facebook friends. Ask your Facebook friends who have Twitter accounts to retweet your service related tweets. You should expect a response from the company within two hours. A request that you direct message (DM) the company with details is a good sign. Watch for responses that appear to be canned vs. responses indicating an actual service contact. Not all brands will respond. The majority of companies view Twitter as a marketing tool, not a service tool. If your Twitter campaign is effective, and your issue gets resolved, be gracious. Thank the company for responding. Don't use Twitter as your first step in resolving a problem. Always be civil. Don't let your anger and frustration get the best of you. A Twitter customer service campaign is time-consuming. If you want results you must allocate time to the effort. Good luck using Twitter to resolve your customer service problem. 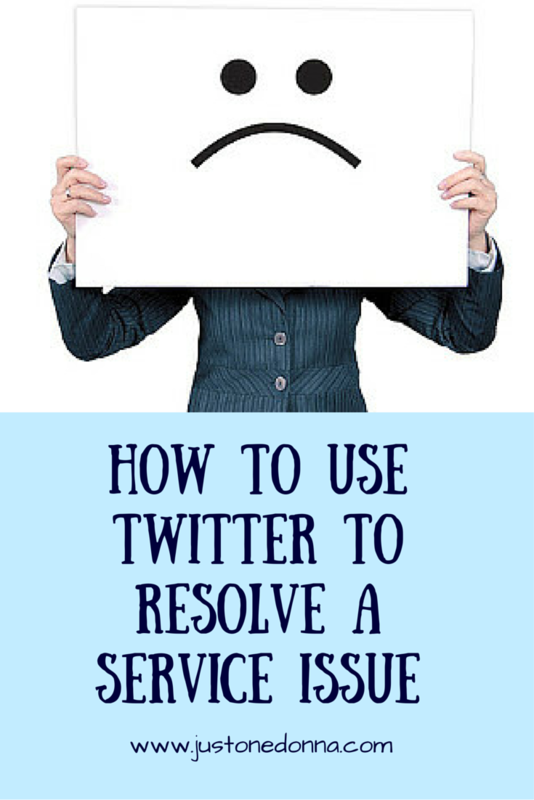 Have you used Twitter to resolve a service issue? Please share your experience in the comments section to help others be successful, too. Before you go.....Never miss a Just One Donna post by signing up to receive posts in your email or your favorite RSS feed. Links are in the sidebar. Twitter is also effective if you're stuck at an airport and there is no information about delayed or cancelled flights coming from your airline. A Twitter barrage from fellow travelers will almost always bring a supervisor to the gate with more info. And, sadly, I have had to use your Twitter tactics to resolve several customer service issues with Lowe's -- with whom I'll never do business again. Lydia, that's exactly how we feel about Macy's now. The damage a company does to its reputation with a poor customer experience can't be repaired. When you lose trust you just don't want to do business with them again! Donna, I love this. I have never thought of using twitter to resolve customer service, but I will remember your advice. My father taught me to be fair and honest in dealings and that is what he expected in return. So I always stand up for myself when I have a bad customer service situation. Now I have a new method to consider. Thanks so much and good for you. Hi, Kathleen. I confess, using Twitter was a last resort after almost 6 months of unresponsiveness from the "normal" customer service channels at Macy's. It was very effective and I won't wait as long the next time!